Well, I guess it had to happen sometime, I thought that I was safe, but apparently I was wrong. Being born in the late 60's, living my childhood in the 70's, and being a teen in the 80's all before the age of instant everything (especially photography) I thought I was safe, but again, I was terribly wrong. 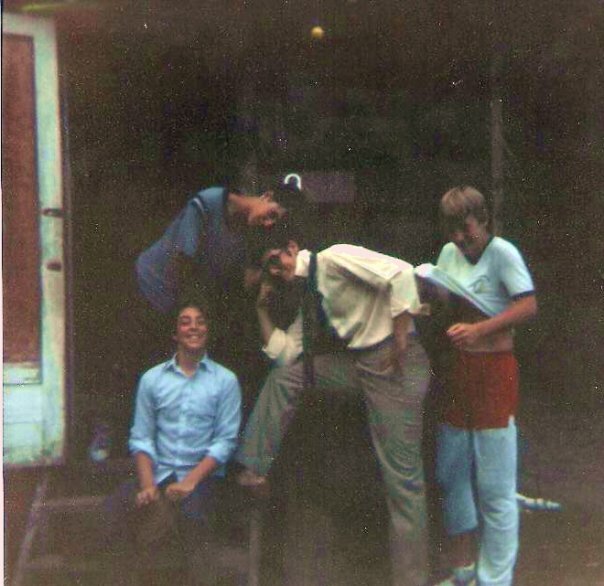 Yesterday out of the blue, like a lightning bolt from the past I got a Facebook message that I needed to check out some old pictures from the camp I grew up attending as a child and spent every summer in my teen years on staff as well. 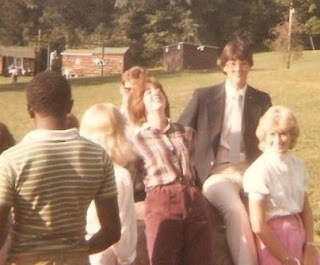 Old School pics were now on the internet for all to see. Anyway, looking at those pics reminded me of some incredible times and also of many of the life changing and direction changing decisions that I made at that place surrounded by friends. It was pretty amazing to stop and think and process all that I've been through, and what was going on in my life during those summers. I was dealing with stuff that those guys knew nothing about, and if only I knew then what I know now about how important things like seeking support and encouragement in relationships really is, I just wonder if I could have avoided alot of inner pain. My teen years were definitely difficult, and full of questions and doubts. As I kept scrolling I kept thinking of all the wresting with God that I did on the shores of that tiny lake in the heart of the Finger Lakes region of NY. In many ways it was as if my life then was being lived in the wilderness. I was between Canaan and Egypt, kind of wandering and wondering, about God, His Son, The Church, His people, my place within all of it and just basically who I was and why I was here? Now looking back I can add some more questions...what was I thinking and why was I wearing that? Well, as I continued my old school trip down memory lane I thought of the lyrics to a song that I've used many times in communicating truths as a Youth Pastor, but now the lyrics reminded me of how I felt as a child and especially a teenager. The song is called Wilderness by The OC Supertones. Thanks to these lyrics and some super grainy snapshots from the past, yesterday I was able to flash back to some tough and terrific times all at once. God brought me through the wilderness then, and I'm so glad that when I start to pack my bags and pitch my tent back in it, He uses things from the Old School to bring me back to the present that He is God, and He's still at work! My prayer is that whether you're in the Old School or the New School, you would realize that every journey has a wilderness...but God doesn't want you to build your house there, keep moving forward with the Master Navigator! The rain falls on the righteous and the wicked, and mine is not to reason why this is. In this I rest in this I find my refuge, that my thoughts and ways are not His. I spend my life on looking up the answers It’s rare that I can’t find a reason why, but reasons fail at children without mothers His plan is more than I can know. Have you ever held in doubt what this life is all about, have you questioned all these things that seem important to us? Do you really wanna know or are you a little scared You’re afraid that God is not exactly what you’d have Him be. What should I hold to and what should I do? How do I know if anything’s true? I’m somewhere in-between Canaan and Egypt a place called the wilderness. I’m not one who always trusts their feelings, I don’t believe in what you’d call blind faith. But faith that you can do all that you promised, and you said it all works for good. It’s safe to say I don’t see the big picture, I can’t see the forest for the trees, and if five hundred lives Were mine to get to know You all could be spent on just this. God do you really understand what it’s like to be a man? Have You ever felt the weight of loving all the things you Hate? Have You struggled? Have you worried? How can You sympathize? I have spoken much too soon put my hand over my mouth I can’t contend with You. Your ways are so much higher and we pass through the fire that Christ endured before us when You were in the wilderness. I feel for you Brent. Great pics, though I would have kept them hidden LOL! It's tough getting old...if it was up to me, believe me they would still be locked away in some attic or basement...oh well, it makes for good personal illustrations...I'm actually working on an article about broken promises from those days...remember the yearbook "promises" "Love ya lots", "Best friends forever", Love ya till the end of time", and my personal favorite "I think you're foxy, and you always will be" (well that one may still be true ha ha)...anyway, you gotta love the old school...when are you gonna break out some of yours? Tre...the creekside team ID is mine as well...anyway ODE to the OLD School! If it makes you feel better, all of us junior-high guys wanted to be just like Brent Carl. Andrew, that's too funny! I love your facebook status, that cracked me up...thanks for your comment, keep up the great work in Brazil!